To the delight of South American DEVO fans, DEVO performed live in Sao Paulo, Brazil on November 10th, 2007. I was not able to attend, but was able to piece together this show report from images and stories submitted by fans who were there. Thanks to Antonio Bustos for his report below from DEVO's show in Sao Paulo, Brazil...and to everyone else who submitted photos & info. DEVO was scheduled to perform in Santiago, Chile on Nov. 11th, but the show was cancelled at the last minute. A strike at the Brazil airport made it impossible for DEVO to receive their equipment in Chile in time for the show. I've posted a few images from the aborted Chile show following Antonio's Brazil show report. When I knew that my favourite music band would be on tour in Latin America I thought: “I have to be there”. It would be a memorable and unforgettable moment for all the Latin American fans who have grown up listening to their records. We would now have the opportunity to see them and listen to them live. My trip started in Santiago, Chile on Friday, November 9th from where I flew four hours to Sao Paulo, one of the biggest and most beautiful Brazilian cities. The day of the concert, Saturday, November 10th, at about 4 PM I went to the place where the concert would take place. The name of the event was “Festival Planeta Terra”, organized by the biggest Internet company in Brazil, Terra. The idea was to offer a big variety of musical shows, more than fifteen, performing for ten hours continuously. The infrastructure was amazing. There were 3 stages working simultaneously, 1.5 millions watts in lighting and 800,000 watts in sound. Besides, it was possible to find food garden, bar areas, Internet access, clothing and accessory stores, all of them distributed in an area of 150,000 square meters. The place started to become full slowly with young people who wanted to see their favourite bands, one of them was DEVO, of course. Some people showed their T-shirts with logos or pictures of the band from Akron, Ohio on them. At the end of the day, there were more than twenty thousand people. The show with national bands on the main stage started at 5:30 PM. Each band performed for one hour. Among the bands was “Pato Fu” whose vocalist recognized her deep admiration to DEVO and let us know that there are very good rock bands in Brazil. At 10 PM it was Lily Allen’s turn. The young British singer was giving her last show of the year. Just after 11:30 PM it was DEVO’s turn at last. It was maybe one of the most expected shows that day. At that time, the place was crowded by DEVO fans who chanted the band name asking for them to be soon on stage to delight them with their show. At the same time, on a close stage, the New York band “The Rapture” was starting their show. 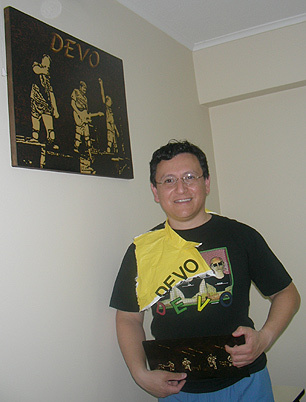 As an anecdote, the Pato Fu’s vocalist went up to the stage when DEVO was performing Jocko Homo in order to catch one of the band's yellow suits. The woman was immediately taken out by the security guards of the place while the rest of the band kept throwing their suits to the fans. It is worth mentioning that Josh Freese’s solid performance made for an amazing show as he beat out a strong sound for each song. After a short pause near the end of the show, Jerry Casale announces Booji Boy who sings the falsetto in Beautiful World, which was the last song of the show. Booji tossed little green rubber balls into the crowd. The audience was shouting during this wonderful ending, letting DEVO know that they are the best band in the “Festival Planeta Terra”. Sao Paulo, Brazil, November 10th 2007.